Three Olmec celts. 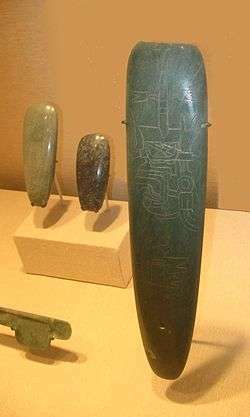 The one in the foreground is incised with an image of an Olmec supernatural. It is likely that these "tools" had a strictly ritual function. The term "celt" came about from what was very probably a copyist's error in many medieval manuscript copies of Job 19:24 in the Latin Vulgate Bible, which became enshrined in the authoritative Sixto-Clementine printed edition of 1592; however the Codex Amiatinus, for example, does not contain the mistake. In the passage: Stylo ferreo, et plumbi lamina, vel certe sculpantur in silice (from Job 19:24, "Let it indeed be carved with an iron pen on a plate of lead or in stone"), the certe ("indeed") was spelled as celte by mistake, which would have to be the ablative of a non-existent third-declension noun celtes or celtis, the ablative case giving the sense "with/by a celt". Neither the Hebrew text (בעט־ברזל ועפרת לעד בצור יחצבון) nor the Septuagint (εν γραφείωa σιδηρώ και μολίβδω η εν πέτραις εγγλυφήναι) has a word corresponding to either certe or celte. This is now considered to be the case by most scholars, although some are still prepared to consider the existence of a real Latin word. A 'Celt' was thus wrongly assumed to be a type of ancient chisel. Early eighteenth century antiquarians, such as Lorenz Beger, then adopted the word for the stone and bronze tools they were finding at prehistoric sites; the OED suggests that the imaginary etymological connection with the Celts may have assisted its passage into common use. There are other possibly related words found in late Medieval Europe, all possibly descended from the Vulgate text, which was taken to be genuine Latin. There are two Rhineland charters in Latin, which use such phrases as celtes seu fracmina lapidum to describe chips of stone to be used for making a road. There may also have been a rare Welsh word cellt, meaning "flint stone" or "[nut]shell", but the OED calls it "obscure". 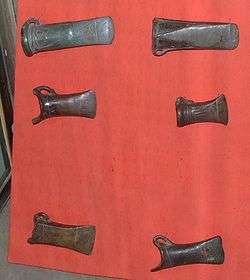 "Celt, a word in common use among British and French archaeologists to describe the hatchets, adzes or chisels of chipped or shaped stone used by primitive man". Encyclopædia Britannica (11th ed.). 1911.